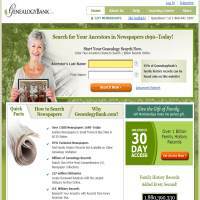 Genealogy Bank is a genealogy website which specializes in archiving US newspaper articles. The vast majority of its documents are available on the website, meaning that you won’t have to keep paying random access charges. The newspapers cover all 50 US states, from 1690 until present day, although the majority of documents are from 1788 until 1984. Special collections include documents from the Revolutionary and Civil War, which makes this a really useful resource if those periods are part of your interests. There are over 1 billion articles from more than 6000 newspaper titles, so if you’re looking for a newspaper article published in the US at some point in the past, this is a good place to find it. Being so specialized, GenealogyBank isn’t suitable for all genealogy research. Whilst its newspaper collections are impressive, you won’t find a great deal of other documents. It also has very few tools, and no family tree builder options. The online store sells a variety of books for all sorts of genealogical research, such as Jewish or Polish genealogy. If you’re looking for information on immigration into the US, this might be a good starting point. However, the site doesn’t really provide many articles to read, which would have been helpful to new and more seasoned researchers. GenealogyBank.com offers no free trial options, so if you want to investigate what’s on offer then you’ll have to pay for membership. You need to be careful to cancel the 30 day trial otherwise you’ll be paying full whack thereafter. Month-by-month contracts are a little expensive for a (pretty much) newspaper-only resource, but the 12 month contracts offer decent discount and are an affordable way to explore hundreds of years of US history. We’d like to see more community features on this site, so that members could exchange ideas, resources and information they’ve discovered. There’s also very little in the way of suggestions for new researchers, so they might get a little lost until they work out their way around. To conclude, if you need to access historic US newspaper articles, this site is a great place to visit. However, it doesn’t offer a great deal more, and its monthly prices are somewhat steep unless you take out a 12 month contract. This doesn’t make it ideal for people who just want one or two items, so you really must need to work through plenty of newspapers to make it worth your money.